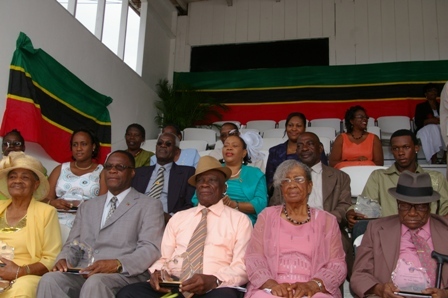 Charlestown, Nevis–(Monday, September 19th, 2011) Premier of Nevis the Hon. 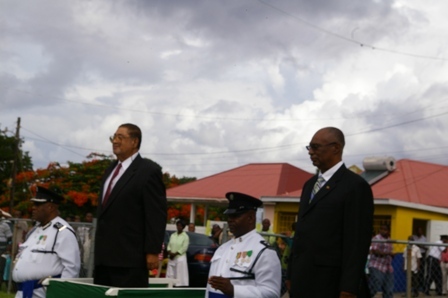 Joseph Parry, congratulated the fifteen honorees for their hard work and dedication to Nevis, when he delivered his address to mark the 28th Independence anniversary of the Federation of St. Kitts and Nevis, at the Elquemedo Willett Park on Monday morning. While he bestowed accolades on the awardees, Premier Parry singled out three of the honorees for their outstanding contribution to the island. “I want to thank Mr. Evan Jeffers former postman who is 92 years old but made it here today to receive his trophy,” Premier Parry said. The Hon. Joseph Parry also congratulated Mr. Hubert Brand for pioneering the first beverage factory in Nevis and the Nevis Bakery which is now celebrating 50 years of operations. “Mr. 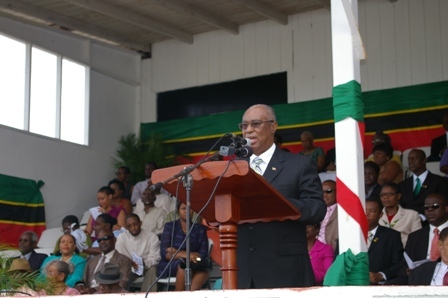 Liburd has been speaker of the Federal Parliament, Legal Advisor and when things got difficult in the Administration; he sacrificed his office to come and do public service,” commented the Premier who asked the audience to applaud Mr. Liburd. Meantime, the Premier told the audience that Nevis has much to thank God for and made special note of the regular rains the island had received for the last six months. “We are not only fortunate that we have regular rain and Nevis is looking very green and so beautiful but the fact that the blessing of God has helped the island not to have to experience any dangerously heavy storms during the hurricane season [so far],” the Premier said. He explained however, that Nevis typically experienced bad storms during the months of November or October but the island could ill afford another closure of the Four Seasons Resort and called for continued protection from God. “During this time I ask the people of Nevis to continue to pray, so that no difficult storms bring harm to our island,” said the Premier.